This interpretation will be in the form of snap shots in time as it is in life. The experience I had has mostly faded but every so often (as anything that causes a big impact on your life tends to do) a memory of a time in our life pops into our head, triggered by a news item, an article, or an association. And this experience of having the line of a song pop into my head has always been there for me. During my psychosis and with associated mania, the ability to pluck ‘puns’ and ‘songs’ out of thin air was electrifying and exhilarating in the first degree: I felt alive, confident and magical. From the present looking back my life is often about the need to catch up and fill in the gaps that were taken from my anticipated version of what having a child was all about. This includes learning Reiki as a way of continued healing for myself and others, working from a local hub that supports women and their families before, during and after childbirth and most recently setting up a small group for toddlers to experience music via percussion instruments and song. 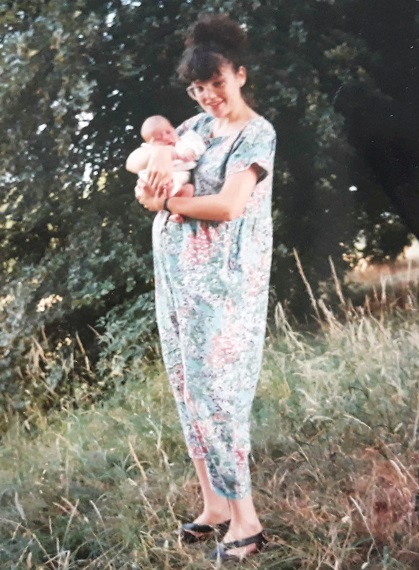 Hannah was born on 4th July 1990 in the early hours of the morning in the place I had but a few short weeks before worked as a midwife, blurring of lines and boundaries showing itself already. The labour was long and augmented, the delivery scary and traumatic. To a background of a really hot summer, the World Cup and a full to overflowing maternity unit and special care baby unit. I remember thinking my baby had died as the time between eventual delivery and her first cry felt like an eternity. I was shown a quick glimpse of our daughter before she was rushed away in an incubator by the paediatricians with my husband Kevin following as her chaperone. Kevin came back with a photograph the Special care staff had taken of Hannah, with tubes and leads everywhere, a misshaped head and the distinctive mark of the shape of forceps over her swollen eyes. I hugged the photograph and longed to meet her properly in person. This was my former place of work and full to capacity. I needed a blood transfusion and had a catheter in place. I was exhausted but could not really sleep. Fast forward three days. I just thought I was superwoman and was going up and down the back stairs to visit Hannah. I had registered her birth because I knew the Registrar and on which days she visited the ward. That night I was very agitated and kept asking over and over why Kevin or anybody else had not thanked me. I felt everything was speeding up; I was talking rapidly and had this incredible sinking feeling. The Sister on the ward had told Kevin she was worried about how much water I was drinking, jug after jug, after jug. At the time I felt it was helping correct the sinking feeling. Everything felt as if I was in a bizarre sci-fi film and the only way I can describe it was that everything felt in reverse and I was in some sort of Vortex. Behind the scenes Kevin had expressed concern about my behaviour and told the night staff; luckily it was Lynne, someone I had trained with and knew me pretty well. The day staff felt they had no evidence of strange behaviour and if I was disorientated it was understandable because of the traumatic delivery. Kevin remembered me telling him about a time when I did my community experience where a new mother had felt she had special powers and that if she dropped her baby out of the top floor window the baby would have grown angel wings and floated away. His concern, therefore, was that I would harm Hannah in some way and she, more than I, needed protection. He had no more insight or information about the effects of Postpartum Psychosis and the danger it would have to me. Hannah was recovering from her ordeal and was spending parts of the day with me and going back to Special care for her tests and intravenous antibiotics. On day ten we transferred to Park Prewett Hospital Mother and Baby Unit. I was visited by a psychiatrist on the ward, assessed and given tranquillisers and anti-psychotic medication. The delay was to ensure Hannah and I were well enough to travel. Another midwife, Stella, a previous student midwife I had helped train, was assigned to accompany us in our car while Kevin drove us to Basingstoke. I wasn’t really aware of the plan and where or why I was going. The car journey was terrifying. I felt as if everything was super-fast while still feeling this sinking feeling and having to sink further and further down the seat to an almost lying position whilst trying to keep drinking water to help prevent the feeling but to no avail. At one point I was so scared I opened the car door to try and escape. On arrival at Downside Mother and Baby Unit (who picked the name I wonder?) all I could hear was a very distressed lady calling out constantly “I can’t care for him. 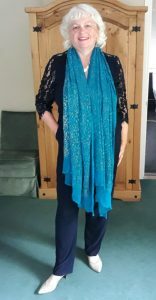 I can’t care for him.” I knew Park Prewett Hospital from my Psychiatric experience as a student nurse and didn’t think I belonged here and didn’t understand why I had come because there was nothing wrong with me. Fast forward a few weeks. The initial mania had been replaced by a drugged slowing. I was heavily sedated and given a sun cream to wear because the Largactil had the side effect of making the skin very sensitive to sunlight and prevent burning. I was told would have to stop breastfeeding, which had been intermittent because of my unpredictability anyway. I found that Hannah had taken easily to the breast and I had had no problems feeding her. A tank was set up in the kitchen along with all the other mum’s sterilising units in my part of our shared kitchen. The ward was part of the old Victorian building which had high ceilings and an ancient plumbing system. I remember thinking that that was part of my many ‘tests’ I had been set. I wasn’t told it would take a long time for the water to go from stone cold to warm and eventually learnt that it was ok to run the tap for a long time instead of my method of filling a bucket from the urn and hand filling the bath. All of this also happened before the smoking ban and I was never sure who were our nurses and who were patients as both openly smoked in the communal lounge. We had our own rooms at the end of a long corridor and the nursery was behind the Sister’s office where we were all allocated an old fashion Silver Cross pram to place our babies in during the day. I had been living and caring for Hannah for around four months and had sunk into a depression. After discussion it was decided that ECT (Electroconvulsive therapy) would be the quickest way to reverse the brain out of depression. An initial course of ten was ordered and I went once a week in a mini bus to the ECT suite a la ‘one flew Over a Cuckoo’s Nest’. The first time I went a very kind houseman cycled over so he could hold my hand as I had never had an anaesthetic before and felt pretty frightened. I got a massive headache due to the side effects of ECT and Hannah was always cared for by the nursing staff for a few hours while I recovered in my darkened room. The more lasting effect was short term memory loss. After another round of ECT which improved the depression, I was unable to recall Nursery Rhymes and a few other dates and events. Over the course of time and years these all eventually came back to me. Fast forward to the present and this is why I am so happy to be offering Music with Baby classes; it feels very healing as well as enjoyable. There was certainly a wonderful camaraderie we woman developed and a lot of us stayed in touch long after our eventual discharge from hospital. Coming home was gradual and involved just one night at home, then two, then a weekend, a long weekend and a full week until our final discharge. When I did get home, I missed the ward so much as it felt safe and there was always someone there to ask questions and talk to. Five months later and I still felt incredibly isolated and alone and found it hard to pick up any threads of my former life. Mothers I had known in antenatal classes were in their groove and routines and I felt very different and ashamed that somehow, I was responsible for getting ill. Some family members and friends preferred not to mention my illness which only added to the stigma. I missed the daily crossword with coffee at ten, the walks in the extensive grounds with Bernie, the shop, the hairdressers (not my best look) and Art therapy. Fast forward to nine months later and I revisited the ward as it was suggested to me that I could offer hope to the women who had through no fault of their own found themselves in this other strange and frightening void after childbirth. This is an abridged version of events. Which offers the light and the shade of my experience of Postpartum Psychosis. I wish to always champion the marginalised person in any situation, and I now feel very empowered. Looking back, I have no regrets and own the experience as part of my life story. It has been a great leveller and I now view the world from a different perspective. You can recover from this illness. It happened twice to me, and I also developed Manic Depression, but I eventually recovered. It will change you forever but not for the worse.